At the end of August, we travelled to Bosnia & Herzegovina to attend and present as part of a panel at the 18th Annual Conference of the European Society of Criminology in Sarajevo. The panel, chaired by John Winterdyk, Contextualizing modern-day responses to human trafficking: Moving the agenda forward, included our presentation, Family-Based Torturers & Human Traffickers: ‘Our’ Population & Our Practice. Jeanne's report as a panelist at this book launch regarding a paper we co-authored with Jackie Jones entitled “How Non-State Torture is Gendered and Invisibilized: Canada’s Non-Compliance with the Committee Against Torture’s Recommendations”. 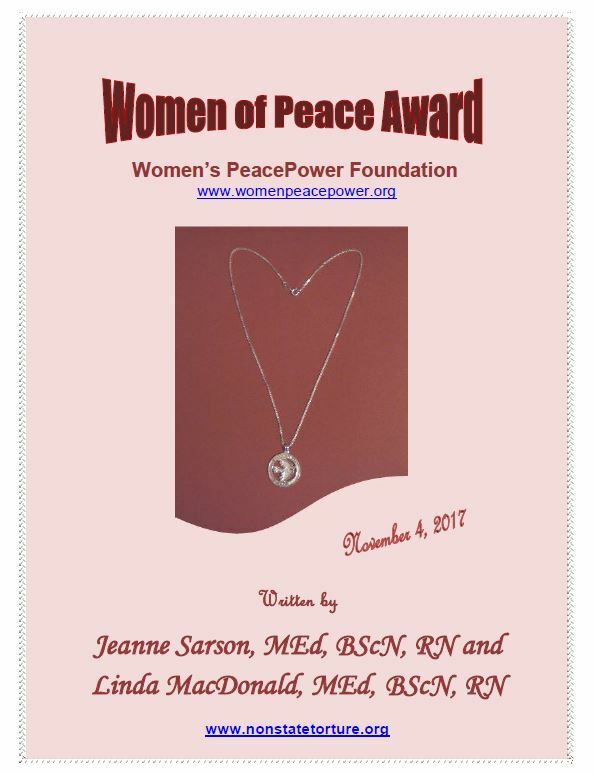 We received this award November 4th, 2017 for our work on non-State torture and human trafficking from Women's PeacePower Foundation. October 11, 2017 submission requests that women and girls who have suffered NST in the domestic/private sphere are a specific vulnerable group whose physical and mental health has been consequently grievously harmed must be included in the report by the UN OHCHR. November 17, 2017 letter to MP Maryam Monsef explaining why naming non-State torture must be included in the Canadian Government Strategy to Prevent and Address Gender-Based Violence. September 23, 2017, a follow-up letter to Minister Monsef asking about her decision to name NST in the Goverment's Strategy and to identify Canada's accountability to the UN Sustainable Development Goals (SDGs) that impact on gender based violence. June 28, 2017, our letter following the meeting with Minister Maryam Monsef to provide further information on the necessity to name Non-State Torture in the Government's Strategy to Address Gender Based Violence. July 10, 2016, our Truth-Telling submission to the House of Commons Standing Committee on the Status of Women for its Study on Violence against Young Women and Girls in Canada. July 31, 2017 letter we wrote Justin Trudeau, Prime Minister of Canada to ask him as Minister for Youth about his role upholding the human rights that no one should be subjected to non-State torture. July 30, 2017 Jeanne's response Non-State Torture: a Response to Ibrahim Kira's "Critical Outlook at Torture" ... in The Society for the Study of Peace, Conflict & Violence journal. She highlights the subjective sexualized pleasures of torturers. In June 2017, as nurses, we attended the CNA Meeting and successfully lobbied to have Resolution 2 on the Development of a Position Statement on the Human Rights Violation of Non-State Torture (page 3) adopted by a unanimous vote. June 7, 2017 letter to Chrystia Freeland, Minister of Foreign Affairs, Canada speaking about a "feminist assistance policy" and gender equality rights. 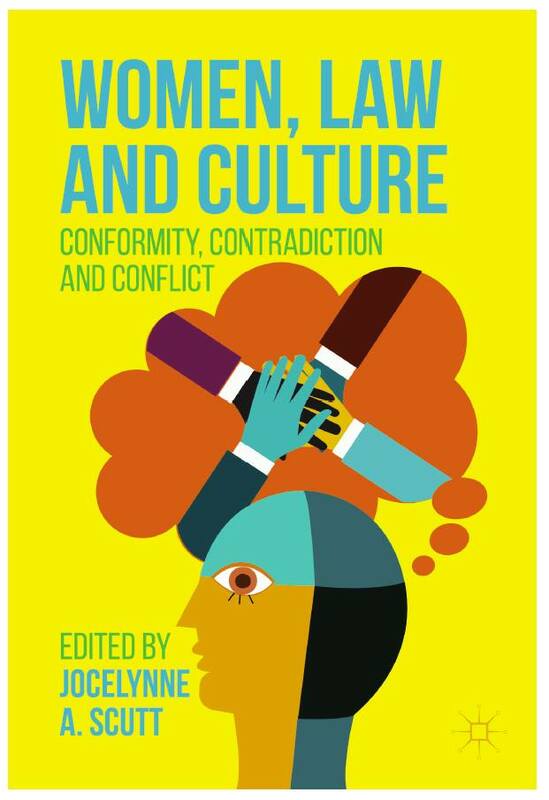 We are proud to announce that our work is included in a new book, Women, Law and Culture Conformity Contradiction and Conflict, edited by Jocelynne Scutt. Our chapter is entitled, Seeking Equality - Justice and Women's and Girls' Human Right Not to Be Subjected to Non-State Torture. In March, we appeared on a panel at the UN Commission on the Status of Women, 61st Session. Our presentation: A Canadian Experience: Discrimination in law on non-State torture negates human right equality, social justice & inclusion of victimized women & girls. Jeanne's work is published in the Journal of Human Trafficking, "Review of Human Trafficking: Contexts and Connections to Conventional Crime". Edited by Joan A. Reid. Oxon, UK, and New York, NY: Routledge, 2016. 150 pages. ISBN: 978-1-138-65285-9, $155.00 (hardcover) Jeanne Sarson pages 1-3 Published online: 10 February 2017. Presenting at EUROCRIM 2018 in Sarajevo, on the panel Contextualizing modern-day responses to human trafficking: Moving the agenda forward. Simon Häggström, Swedish Police, speaking in Truro, Nova Scotia, Canada to police and community support persons about sexualized human trafficking, prostitution and the implementation of the Nordic Model in Sweden. A resolution on Non-State Torture is adopted at the Annual meeting of the Canadian Nurses Association, June 2017. Linda MacDonald, MP Maryam Monsef and Jeanne Sarson following the June 28, 2017 meeting. The visual graphic was created over a 2 day Training Forum at the Tri-County Women's Centre, Yarmouth NS, Canada called Sexualized Human Trafficking & Exploitation - Collaborating to END Demand. Our presentation was titled "Non-State Torture (NST) Organized Family Operators." Our brief in response to Motion M-47 - Victimizing Effects On Those Forcedly Pornogrofied And Harmed From The Other Side Of The Camera By Family Based Exploiters. Support letter for Motion 47 - public health effects of the ease of access and viewing of online violent and degrading sexually explicit material on children, women and men. Our Letter to MP Bill Casey about Bill C-242. Thirty-seven years of herstorical evidence that the Canadian Government has known of non-State torture and requesting NST to be criminalized in the Criminal Code of Canada. Minister of Justice, Jody Wilson Raybould's response to this letter. 2014 letter to Minister of Justice Peter MacKay regarding Bill C-36 addressing the then proposed new law on prostitution in Canada and the impacts of the Bedford Decision and how this makes the world unsafe for children. A person who has been tortured has the right to speak their truth, to be believed, and to seek justice for the torture they suffered.